Slate roof tile is the most expensive type of roofing for residential purposes. No two slate roofs are exactly alike, and this exclusivity adds to the appeal. Many homeowners love the beauty and natural durability of stone, and slate is well suited for roofing purposes. On the East Coast, many historical buildings and homes that use slate roof tile have withstood the test of time and only increased in elegance. Slate is layers of fine grained shale rock which is quarried in the US or imported from Europe, Asia or Africa. Depending on the quarry site, the slate will have certain unique colors and designs. Slate is then cut into flat layers and then into smaller pieces, which can be used as roof tiles. The most common slate roof tile colors are red, grey-blue, purple-grey, green and black. Some types of slate change color due to weathering. Some homeowners use several different colors in a layered pattern for added curb appeal. Slate is graded according to its overall durability. Most slate roofs are guaranteed to last at least 30 years, if not more than 100. Slate is highly fire resistant and doesn’t corrode. Slate roof tile doesn’t require any extra sealant and is resistant to algae and moss. For the best roofing quality, roof tiles should be uniform in both size and thickness. 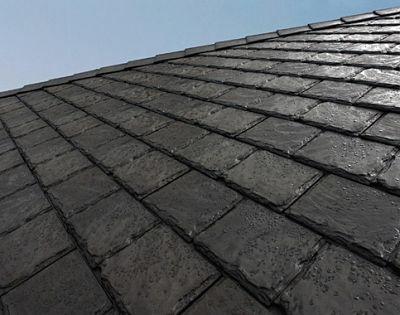 Slate roof tile is often used on highly sloped roofs, but roofers should install proper underlayments, such as heavy felt or roofing membrane, as well as flashing to prevent leaks. Many manufacturers of slate roof tile also pre-drill nail holes in the tile to prevent breakage during installation. Copper nails are often used to avoid rusting. A slate cutter and slate hammer are also needed for proper installation. Slate roof tile is a very heavy roofing material, weighing much more than conventional asphalt shingles. Before installing a slate roof on a new or existing home, homeowners need to make sure the house has enough structural supports to handle the extra weight. Proper installation of a slate roof tile is expensive, but crucial. Even transporting, storing and placing heavy slate tiles on the roof requires some foresight. Slate roof tiles are durable, but prone to breakage if someone walks on a roof in an incorrect manner. Homeowners should choose a roofing company with extensive expertise in installing and maintaining a slate tile roof in their local area.